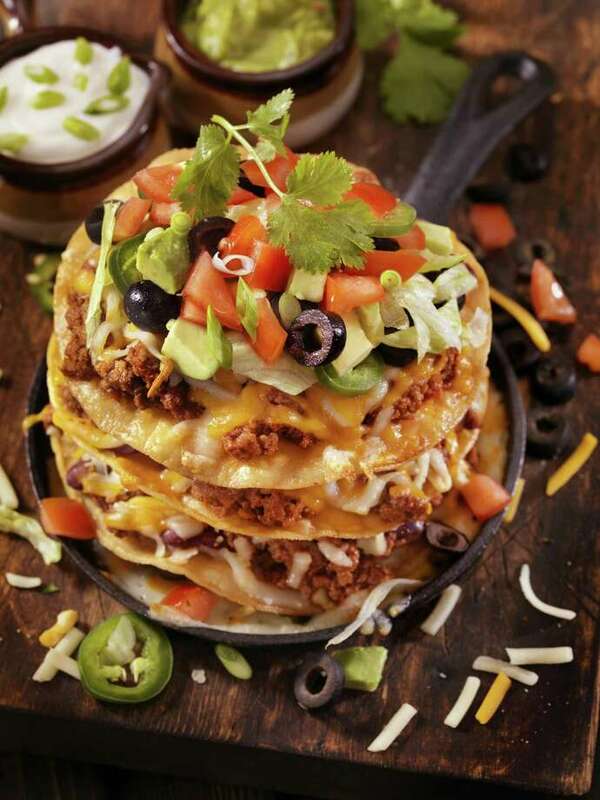 Chili Cheese Tostada Tower. In a cooking rut? Switch up Taco Tuesday for Tostada Thursday. Tostadas are basically tacos, but this time the shell is flat and the toppings are a little different. Maile Carpenter, editor in chief of Food Network Magazine, offer s new takes on old recipes. Q: Meatless Monday, Taco Tuesday, Wednesday pasta, Thursday chicken … Is that an old-fashioned notion or do home cooks generally rely on repeating tried-and-true recipes? A: I think almost every home cook has a routine of some kind, but most of our readers are excited about trying new dishes, so we try to make this as easy as possible. We don’t expect people to give up their weekly chicken breast recipe or skip Taco Tuesday. We just want them to try new takes on old favorites. For example, in our May issue there’s a recipe for burger night, but this time the burger has a French twist; it’s topped with brie and a shallot-dressed watercress salad. And in the same issue, we created some super-easy tostadas; they’re basically tacos — we know everyone loves taco night — but this time the shell is flat and the toppings are a little different. Presto, you’re out of your dinner rut. Q: Learning a new recipe then putting it into your meal planning rotation can be difficult. How can we break the habit of making the same dishes over and over? A: It can be hard to try new dishes and techniques during a busy week, so I often save my recipe trials for the weekend. Saturday and Sunday nights have become like tasting sessions for the family; the kids get to weigh in (they turn down pretty much everything!) and everyone votes on which dishes get to advance into our regular meal rotation. If making entirely new dinners is tough, sides are a great way to make a meal feel different. If you have a basic protein you love making, try serving it with new sides each time. Our readers are always looking for new ways to get veggies and grains. We included a booklet of 50 spring sides in our April issue. Q: There are so many ethnic recipes available now, but many of them require spices that are not used in other cuisines. You buy a jar, use it once or twice, then it sits in the pantry collecting dust. Any thoughts on what to do? A: It’s so true! I just bought a $10 jar of filé powder to make gumbo a few weeks ago and I guarantee you it will expire before I use it again. The test kitchen chefs at Food Network definitely keep this in mind when they’re developing recipes — if you look closely you’ll see that if they call for a somewhat unusual spice or ingredient, like za’atar or harissa, they’ll call for it in a recipe in the next issue or sometimes within the same issue. One other thought on this: Before you buy an expensive spice for a recipe, you might want to quickly research whether it’s essential. If I had done this, I would have known that the filé powder wasn’t a make-or-break ingredient in the particular gumbo I was making. If you do end up buying a new spice (and you like it), you can always use it to spice up a baked potato or frozen french fries, or throw it onto some popcorn for movie night. Q: Chicken is such a versatile dish. What are some ways to prepare chicken we may not have thought of? A: So funny you should ask — we’re working right now on a story about great, unexpected ways to serve boneless, skinless chicken breast. We know that everyone keeps chicken in the refrigerator for weeknight dinners, and we also know that everyone gets tired of the same old recipes. The story will appear in our June issue, in a special chicken section (yes, we created a whole section just for chicken), and my favorite idea is cooking chicken in a waffle iron. You just cut chicken breasts in half crosswise, pound them out slightly, toss them with vegetable oil and your favorite spice rub and then cook them in an oiled waffle iron for 3 to 5 minutes. Q: Spring has arrived. What dish would you make to celebrate? A: I’m probably supposed to say that I’m going to run to the farmers market and buy fresh asparagus and ramps and baby lettuces, but the truth is, I’m going to make Rice Krispies Treats that look like carrots: You tint the marshmallow mixture orange, press the treats into a pie pan and then cut them into thin wedges; you can add green sour straws to make the carrot tops. This feels pretty springy to me, and better yet, my kids will eat them!